Committee meetings are a critical step in the legislative process, yet aldermen skip them almost half the time. Chicago residents expect their aldermen to show up to work. An alderman has a variety of job responsibilities, but chief among them are considering and voting on city legislation. This role has two elements: attendance at committee meetings and attendance at full City Council meetings. After a piece of legislation is introduced, it is referred to the City Council committee that holds jurisdiction. For example, the Committee on the Budget and Government Operations oversees the expenditure of city funds. During the committee review process, members discuss and debate the legislation at issue. Testimony may be heard, and members may submit amendments or changes to legislation. In general, the committee hearing is where the merits of a piece of legislation are vetted and debated. Full City Council meetings are highly visible, and many media outlets in the city monitor them. Accordingly, aldermen attend nearly every one of those meetings. But committee meetings and hearings are rarely covered unless a pressing matter is on the agenda. And aldermen have a low attendance rate for such meetings. One example of aldermen failing to show up for important City Council business is revealed in attendance rates for city budget hearings. One of the fundamental roles of an alderman is to properly vet the city budget by being present at these hearings and asking questions. Yet, approximately half of aldermen failed to attend city budget hearings in fall 2016. 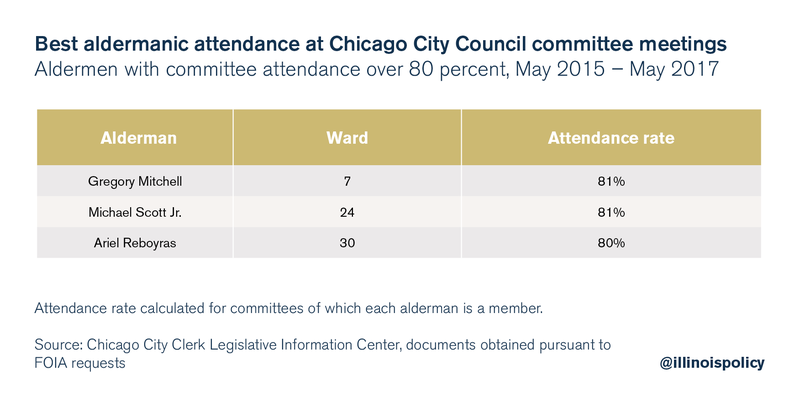 And aldermen have been neglecting committee meeting attendance, another critical component of their job, nearly half the time, according to a review of committee attendance records and data obtained through Freedom of Information Act, or FOIA, requests. The Chicago City Council currently has 16 standing committees of varying size that tend to meet on a monthly basis to consider legislation and refer it to the full City Council for approval. This is a crucial step in the legislative process, as it allows aldermen to address concerns directly from constituents and vote accordingly. Despite the importance of committee meetings, the average committee meeting attendance of aldermen currently serving on the City Council was 57 percent between May 2015 and May 2017. Only three aldermen earn high marks for attendance: Gregory Mitchell, 7th Ward; Ariel Reboyras, 30th Ward; and Michael Scott Jr., 24th Ward. Each attended over 80 percent of his committee assignments from May 2015 through May 2017. On the flip side, several aldermen attended less than 40 percent of their assignments between May 2015 and May 2017: Leslie Hairston, 5th Ward; George Cardenas, 12th Ward; Howard Brookins Jr., 21st Ward; Ricardo Muñoz, 22nd Ward; Michael Zalewski, 23rd Ward; Roberto Maldonado, 26th Ward; Carrie Austin, 34th Ward; and Joseph Moore, 49th Ward. 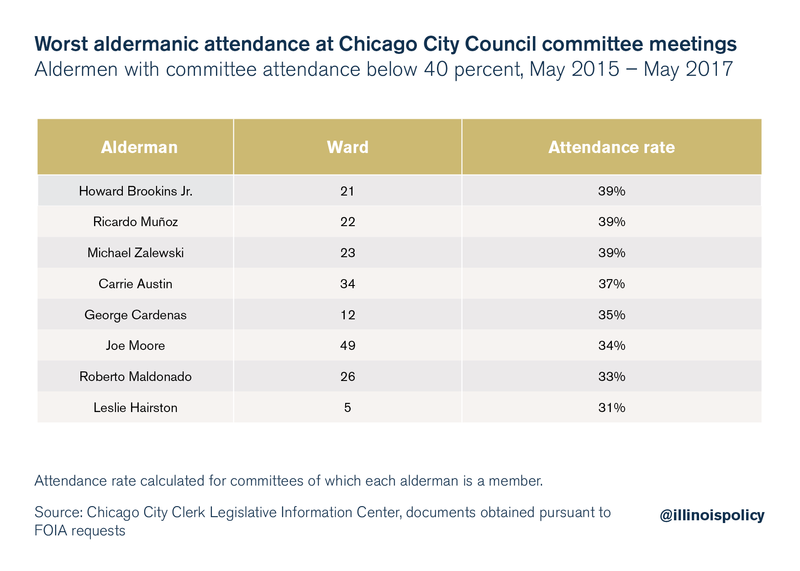 So what happens when so few aldermen attend committee meetings? By law, every meeting needs to have a quorum. A quorum is, according to Rule 39 of the City Council’s Rules of Order and Procedure, “[o]ne-half (½) of the total number of members of each standing committee … (excepting from such total the President Pro Tempore).” Quorum for the Committee on Finance and the Committee on the Budget and Government Operations, however, is designated as 15 members. This rule is straightforward; yet, aldermen continued with committee meetings in the absence of a quorum in approximately 25 percent of all meetings from May 2015 through May 2017. Aldermen are meant to serve as their wards’ representatives in the city’s legislative body. As full City Council meetings get the most media attention, it would appear that all 50 aldermen are fulfilling their duties. Yet, when looking more closely at their attendance at committee meetings, a critical step in the legislative process, a different story unfolds. When taken with data on the types of legislation City Council considers, it’s clear that there are a number of duplicative processes that contribute to such a low attendance rating. For example, the Committee on Pedestrian and Traffic Safety considers disabled parking signs. An individual who wishes to designate disabled parking on the street outside of his or her home must submit an application to the Chicago Department of Finance. This application is obtained and submitted via the alderman’s office, yet it must be approved by the Committee on Pedestrian and Traffic Safety and the full City Council. The City Council should note these findings and consolidate standing committees and eliminate duplicative processes. Furthermore, aldermen should work toward removing themselves from these administrative tasks altogether and designate them to another city authority where possible, allowing City Council members to focus their scarce time and resources on citywide policy issues. The basis for the majority of figures in this report is a search of committee attendance from May 2015 through May 2017 through the Chicago Office of the City Clerk’s Legislative Information Center. Where attendance information wasn’t available, the Illinois Policy Institute submitted FOIA requests to the city clerk for committee monthly reports. Pursuant to Rule 45 of the City Council’s Rules of Order and Procedure, each committee must maintain records of each meeting, including attendance, and file reports with the city clerk on a monthly basis. These data come with a caveat. Attendance numbers for the Committee on the Budget and Government Operations are not included. This is because the attendance records for the committee were unavailable. In response to a FOIA request, the clerk responded, “The Budget Committee has not filed a monthly report since January 2014.” The committee has not responded to attempts to obtain the records directly.